An Ebola Strategy Brings Good News To One Liberian Town : Goats and Soda The town of Foya has had no new cases in a month. Credit goes to a care center and an ongoing effort to calm fears and allow family members to communicate with patients — and view the dead. The nursing staff get a break at the Ebola care center run by Doctors Without Borders in Foya, Liberia. The center has helped stop the spread of the virus. In one corner of Liberia, a community has come together to change the course of the deadly epidemic. New cases have been brought to a standstill. 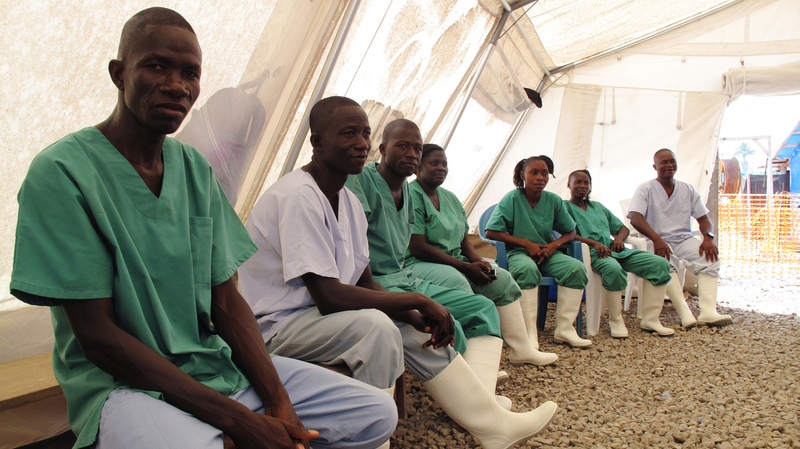 This success shows that it's going to take more than extra beds at a ward to stop Ebola. When Doctors Without Borders arrived in the northern district of Foya in early August, Ebola was out of control. Foya was the first area in Liberia to report cases, and the community has been hit hard. "At the peak, there were 125 patients in the center," says Katy Athersuch, the local communications officer for Doctors Without Borders. "It was a very, very busy time and very stressful." Since then, a lot has changed in this district, which borders Guinea and Sierra Leone. Those changes are the most obvious inside the Ebola care center run by Doctors Without Borders in Foya. In one of the tents inside the low-risk area, a whiteboard lists every Ebola patient in the center. On this day, there are just three names. "It's a very changed situation," Athersuch says. "For the last six weeks now, we've had an average of around 10 patients. So things are very obviously better, but they're not solved." There have been no new cases in Foya for nearly a month — although patients are still arriving from other areas, including the district of Voinjama only 40 miles up the road. Health workers say there are two main reasons the epidemic here has been brought under control. One is this care center, which means sick people aren't at home infecting other people. The other is a massive campaign to connect with the community and to distribute information. This work has been conducted by both local health leaders and Doctors Without Borders staff. Before the medical aid group arrived, people were terrified, says Sylvester Seyoe, a health promoter who lives in Foya. "Every day, all day, you [were] seeing people carrying dead body, dead body, dead body," he says. People weren't just afraid of Ebola. They were afraid of the health care workers, who looked like astronauts and took bodies away in ambulances. Many people thought the workers were collecting bodies to sell the organs, Seyoe says: " 'Oh, these guys [are] only coming to slaughter people and conduct ritualistic acts and make money out of us.' Because of that, people resisted." People even distrusted the chlorine sprayed around infected houses and on people arriving at the Ebola care center, says Esthella Jayah, another health promoter from Foya. People believed, she says, that "if you come to the center, they will spray you with the chlorine, and you will die." So Doctors Without Borders and the local Ebola team put in a new system. Every time an ambulance went to collect a patient or body, they sent a health promoter, like Seyoe and Jayah, to stand outside the house and explain to neighbors what was happening. They also began to allow families to visit patients at the center — from a safe distance. One of the most important changes was allowing family members to see the body of someone who died of Ebola, says Moses Follay, a mental health counselor at the Ebola center. 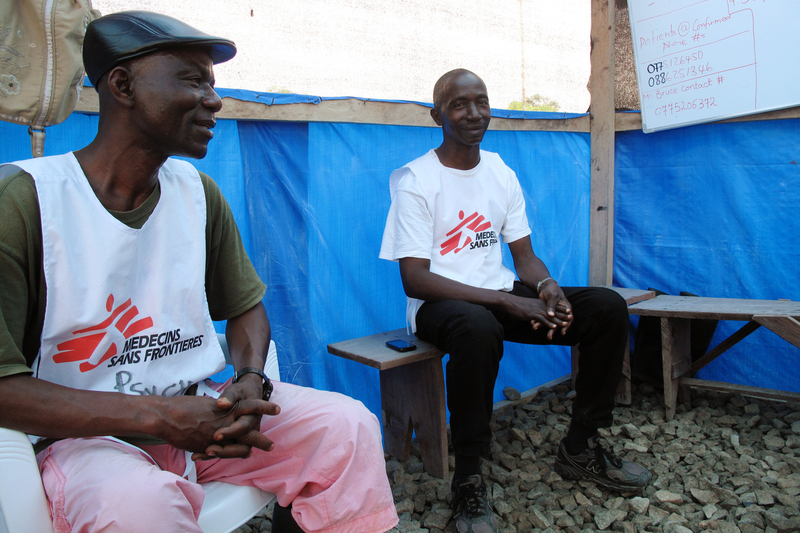 Counselors Moses Follay (right) and Prophet Muhammed Sano try to ease the stresses of Ebola patients and their family members. "It is their right to say, 'I want to see the body before it's been buried,' " Follay says. "It is also their right to say, 'I want to see where the body is buried.' "
The center even has a viewing area where visitors can see the faces of health care workers before they put on masks, goggles and other protective gear. And just a few weeks ago, the staff at the center installed a cellphone booth where patients can make calls to their friends and relatives. All these changes have made a big difference in stemming the epidemic here. That's obvious from the community's response to a radio program that lets residents ask questions about Ebola, health promoter Seyoe says. "They are eager to turn on the radio to listen to the messages from us," he says. Health workers say they're worried that those messages may seem less urgent now that Ebola is no longer such a deadly presence in Foya. Ebola appeared to retreat once before in this area, only to return with frightening speed, says Katy Athersuch of Doctors Without Borders. The group is determined to make sure that doesn't happen again. Within minutes of my exit from the Ebola care center, an ambulance pulls up, carrying another suspected Ebola patient from the neighboring district of Voinjama. It's a sign that Foya can't yet rest easy. In the audio of this story, as in a previous Web version and caption, we mistakenly identify psychosocial counselor Moses Follay as his colleague James Timothy Nah, who also works as a counselor at the Ebola center in Foya, Liberia.